How Do You Bring a Dog To Europe/UK? NO there is no quarantine any longer or we would have never brought Bella along. Simply in your home before you leave, is the required quarantine period. Dogs are required to have a Rabies shot, Tape worm shot and be approved by a Vet certified to do so, as healthy. Then, with all that documentation you get to drive to your local USDA office, in our case, Los Angeles and wait in line for 2hrs to have a girl in the window look over all your documents and decide if you have done it all right, and if not they send you away! If you are good, then they stamp your papers to authorize that they have approved all and you can leave the country and fly on an airplane within 5 days. They DO NOT guarantee you will get into the country you are flying to, that’s your responsibility. Whew, its hard work and we paid extra to have the vet do ALL the paperwork so we knew it was done right. Then you have to decide on the best/right crate for your dog because NEVER ever let your dog fly in cargo, you have to get an Airline that allows dogs in cabin in a crate. 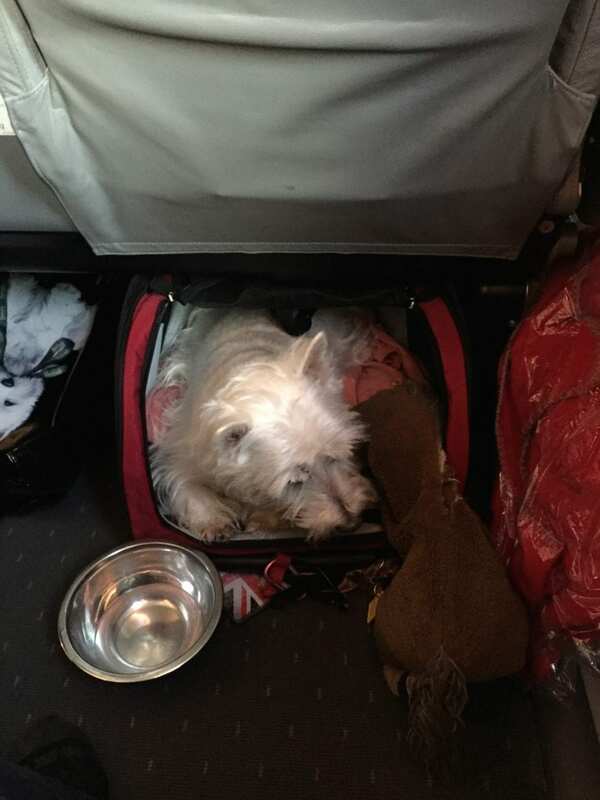 Norwegian is the new kid on the block in Airlines and the one with best- cheapest dog friendly rules and Bella could fly in the cabin. We decided to bump to first class Just in Case there were any issues, we figured we might be treated better if we were in first class and it did make it much smoother. Norwegian doesn’t have Real First Class its really like Business class but two big wide seats so the under storage was quite wide as you can see here. 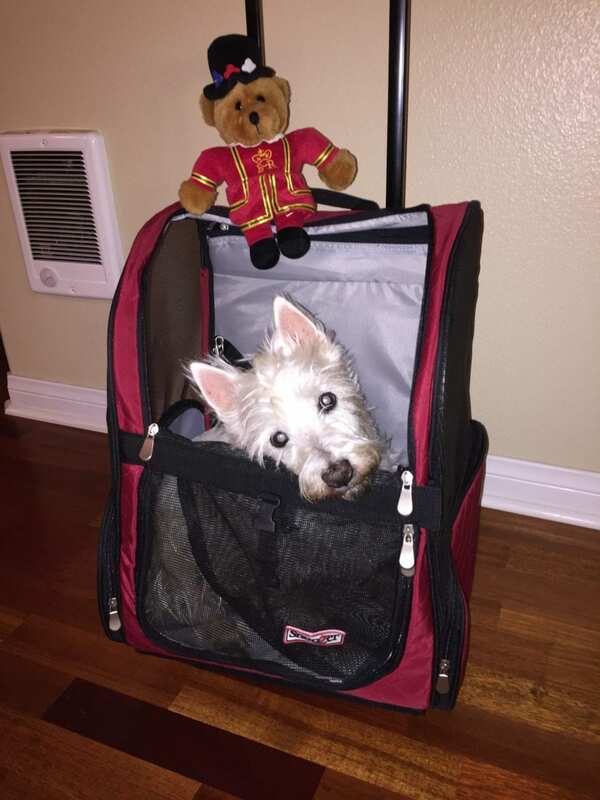 We did a trial run at LAX taking Bella all thru the airport in her cargo crate to get used to the smells/noises and to meet the airline employees to ensure we were doing everything right a week before we flew. I’m a freak for details I know; but I didn’t want anything to go wrong and wanted to ensure we had it all right. I think it really helped and I highly recommend it. We met with the Manager before we flew and when we arrived, luck has it that it was his day off but we had his name to drop and a desk agent remembered us. 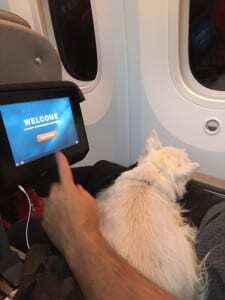 Without the long details and delays, because nothing goes that easy right(we did have small hiccups but all resolved out), We made it to the first class lounge in time for a relaxing glass of champagne and time to take Bella to the doggy outdoor pee areas. Note: do NOT bring canned dog food sealed, this was the hiccup at security, they freaked out over a sealed wet dog food canned because it was bigger than the 3 ounces! stick to dried food and maybe put wet food in a baggy Not in a sealed canned, who knew? I thought the sealed canned proved it was nothing security risks but NO not the case! The big moment arrived and onto the plane we went. Secured Bella under the seat in her crate with her crate shut for takeoffs. Mid flight we were able to let her out at our feet at first and then on our laps after everyone was settled in. We also recommend, and we took, the red eye over night flight so she would just sleep anyway and not have to go to the bathroom; but just in case, we were prepared with weewee pads for dogs and luckily didn’t need them until we got to the airport the next morning. We had an 11 hr flight and she slept/held it the whole way 🙂 LOVE this dog. Her first steps and pee on British soil! This is the crate we chose as it rolls just like luggage but lay it down and its a bed. I didn’t want a crate you have to carry them vs wheel them. it was a bit too narrow in width but overall worked out well and now we use it as her car crate flat in the backseat and she likes her little house. so it was money well spent. We also rented an Air BnB house for 3 weeks to allow for plenty of detox time and getting used to everything for Bella. We brought 2 weeks of food (dog food is really heavy) to ensure no change over food right away. Had already researched similar foods offered as American dog food is not plentiful, so we knew which brand we were looking for soon as we arrived. Bella has special needs and eats only the very best organic,non corn, non chicken food so we were extra prepared. All went well and in fact, we swear, she is doing BETTER here than in California. Pretty sure this Scottish Highland dog loves being in her mother land! Good job on your blog!! I know it’s going to be fun!! Yea!!?? ?